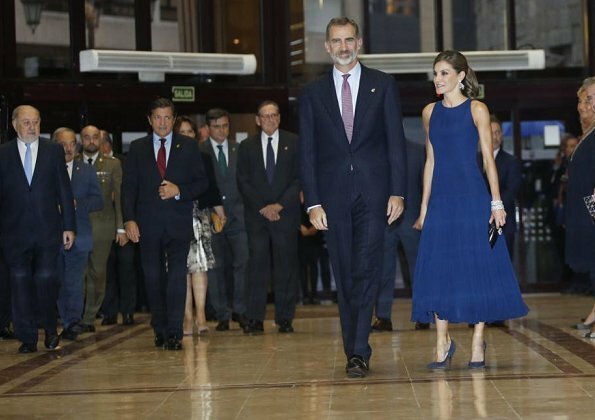 On October 19, 2017, King Felipe and Queen Letizia attended the Princess of Asturias Awards Concert held at Oviedo Auditorium, ahead of the 2017 Princess of Asturias awards ceremony in Oviedo, northern Spain. Presided over by King and Queen of Spain, the Princess of Asturias Awards Concert is held in Oviedo on the eve of the Awards Ceremony as part of a week characterized by intense cultural activity. De acuerdo! Ella es una tesora. Beautiful. Another drop waist! She looks great. Gorgeous stunning! Queen Leticia and Britain's Prince Harry Meghan seem similar chic taste. J'adore la tenue de la reine. Tout à fait sublime. Wunderschöne Bilder, Letizia sieht wieder klasse aus, wie immer. Beautiful! The dress is gorgeous - she can make understated styling look wonderful. Not a care in the world for those two. Fashionwise they look good. Qué más quisiera el gato que lamer el plato. Zape. She really knows how to dress. Stunning! And her haidresser knows what he's doing, she doesn't have more beautiful hair than other royals but she has the most beautiful hairdos. Agree! We mere normals would say "print it and frame it"! Ellos son la pareja real perfecta. 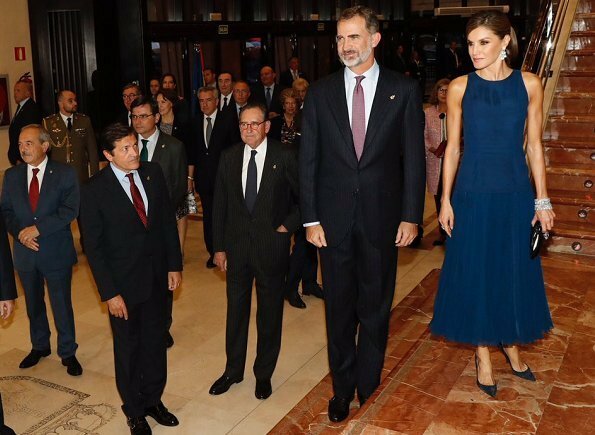 El vestido de Letizia se ve maravilloso en movimiento. Las joyas son magníficas, el peinado juvenil pero pulido y el maquillaje, sublime. Ánimo y fuerza en los días difíciles, Majestades. Simply gorgeous. I wonder though how comfortable it can be with those buttons in the back (while seated). Also, I wonder if the hair is all hers. She recently had a haircut, and a ponytail now surely wouldn´t be this long anymore? Very beautiful simple blue dress. Flattering cut. Less is best in her case. Always the right clutch, earings and shoes. God bless her hairdresser! Absolutely wonderful - particularly like the shade of blue. For me, the perfect royal couple. They represent the institution like no other, with the exception of Queen Elisabeth. Perfection from head to toe! 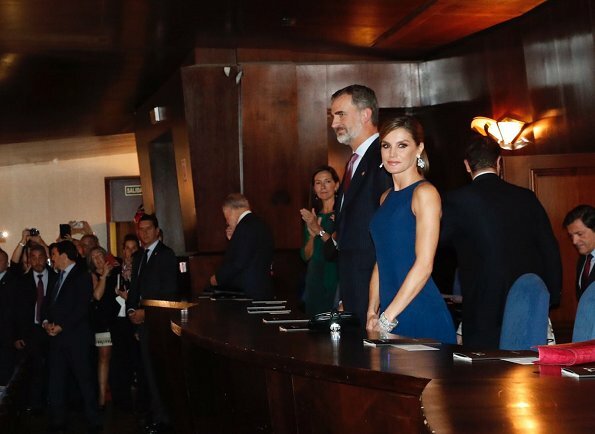 Hair, makeup, jewellery, gown and shoes - Letizia rarely if ever gets it wrong!